Speedy the cheeky house bunny: Christmas Count Down December 24th! Merry Christmas to you all!we sure hope you have a wonderful time tomorrow! Tonight is is the deadline for getting you photo's to my Mum so don't forget it 10pm UK time if you still want to enter my Count down to win one of three surprise gift's. We also signed up to the pet bloggers Christmas gift exchange.we were partnered up with http://www.gopetfriendlyblog.com/ this blog is a pet owners vacation dream site shows you every thing you could possible want to know about taking you pet with on vacation plus they share their own trips with their dogs I have to say we enjoyed this one very much.They are also on http://www.facebook.com/GoPetFriendly and https://twitter.com/GoPetFriendly and are on Google+ which was the easiest for me to follow them on and to be able to make comments on http://gplus.to/GoPetFriendly so go take a visit and see for your selves. Merry Christmas to yous and your peeps from us and ours! Merry Christmas, Speedy and Mom! Merry Christmas Eve to you, Speedy! I never knew so many people had bunnies as pets! how cool! love the tree so pretty! Those wabbits are adorable! I am writing for a travel blog occasionally and have referred to GoPetFriendly quite often now! Very cool that you are paired with them! Merry Christmas and a Happy New Year to you and your mum Speedy. I so loved your Christmas Count Down Speedy, it was so much fun! Merry Christmas special bunny! 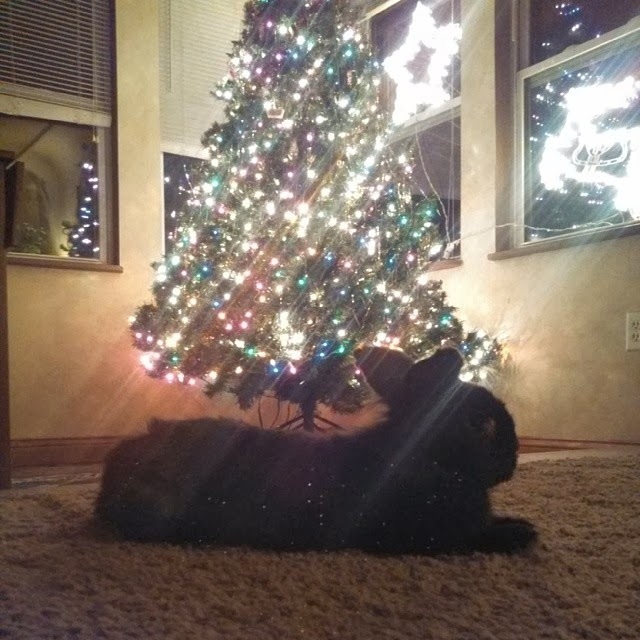 The bunnies look so happy and content under their Christmas tree. BIG Christmas smooches to you, Speedy! And big hugs to mum and Nick and all your blog readers!! Very cute pictures. Merry Christmas, Speedy! Merry Christmas my friends! I like the phrase 'only 1 more sleep'. Thank you for sharing another great blog. I hope you received many wonderful gifts. Dat black fuzzy bunneh iz handsum...ya haz sum guud lookin furendz dere Speedy!! Phankz fer da countdown...me n Mum shure enjoyed it! Thanks for sharing about Amy and Go Pet Friendly in the Pet Blogger's Gift Exchange. 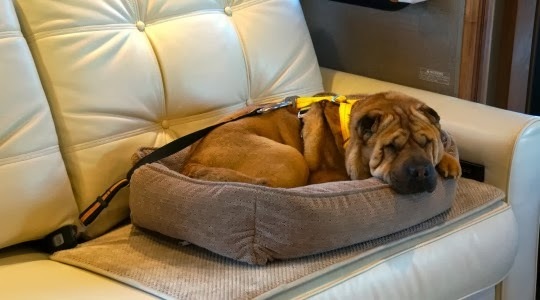 Although they travel with dogs, they know many other people who travel with cats, ferrets, and even bunnies. So if Speedy ever decides to become an RV rabbit instead of a house bunny, you'll know where to go. I'm a huge Go Pet Friendly fan and I loved reading your post highlighting such an awesome blog. Thanks for joining us in the gift exchange this year!